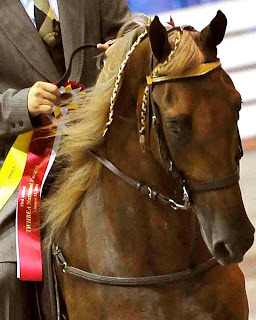 The ride of my life: A reserve ride in the Futurity! A reserve ride in the Futurity! I woke up early. Like 3am. Then 4 am. Then 5am. Finally at 6am I couldn't take it any longer and got out of bed and got ready. By 7am I was out the door with a cup of coffee and an English muffin compliments of Jane. I'm staying here with Jane again on this trip. She lives right across the street from Bobby, bourbon's trainer...so it's very convenient, and so much better than alone at a hotel. By 8am I was on the show grounds in Shelbyville and at the trailer to see bourbon. His eye looked MUCH better. A bit cloudy, but not weeping. So unless you really looked at his poor little eyeball, he looked just fine. Whew! Next was chaps and cowboy hat, and off to the warm up ring. I took Bourbon through DQP, to have him checked....and of course he passed the inspection. However, my warmup wasn't going well. Too many horses it was a bit like rush hour. All stop and go, seriously it was like working a collision course. I just couldn't find my seat. Frustration set in, and I was highly considering just bailing on this whole crazy riding idea. But Bobby and Connie Waldo came to my rescue with a pep talk (Connie) and good swift kick in the @$$ (Bobby)...and I was lined up and going into the ring in no time. It was much better in the ring, room to ride, and I was able to really open Bourbon up. I got B going and timed up, and was pleased to see him shaking and hear him hitting a good four beat gait. The class had about 24 or 26 horses in it... huge class. Probably one of the largest of the day! Plus, there was quite a large audience assembled. Especially for an early morning session. I "rode him like I stole him", as Scott likes to say.....and rode and rode. This big class was also a long class. Flat walk, running walk, reverse, flat walk, running walk.....and then they called for a trail walk. Then we lined up on the East end of the oval. The line of horses covered the entire curve and more. I was kind of in the middle. The 5 judges walked the line and asked us each to back. Bourbon did so without hesitation. Then the long wait while they tallied the scores. When the winner was called, the gal next to me won the class. I, unfortunately did not place. However I did learn later that we made 3 of the 5 judges cards. With one placement a 7th! Not bad for a little girl from Wisconsin on her very first Celebration ride. The morning session concluded around 1pm. The colt center racked up a few very nice ribbons... Including a blue ribbon ride for Darden Gladney aboard Jose's No Countin Me Out. He's already a world grand champion, adding another win to his name! So we all got to go to the winners circle to get a group photo with Darden and his horse. I was part of the "and friends" that they will reference in the caption when they run the photo in the walking horse journals. We went back to Bobby's for the midday, to wash horses and weanlings, and prep for the Futurity. The Futurity is a separate competition for babies, and 2 and 3 year old horses. It's to showcase the upcoming generation stock. Only those nominated at birth can compete. And Bourbon has been nominated. He actually won a 3rd place as a yearling last year for Scott and I right after we bought him. So this year he would be ridden under saddle. BJ, Bobby's son, would ride in this important class...with the potential to win a purse! BJ has actually spent alot of time this past year riding him...so it seemed the appropriate choice in rider. Bourbon exits with BJ and his Reserve ribbon. From the moment BJ and B entered the ring, they looked fabulous. I was so excited! We could win this! Competition was tough...very good horses. And all pro riders. The energy level in the entire arena went up a few notches during this class. Or at least my blood pressure was way up. They looked great! And there was the "buzz buzz buzz" of my cell phone - Scott was texting me the same thoughts....he was watching the live stream of the show over the Internet. (Got to love technology that made it possible for Scott and I to enjoy this class together despite hundreds of miles separating us.) When the riders were asked to line up, I recall taking what I think was my first full breath during that entire class. But roses were not to be ours. The winner was Patrick Thomas on a black 2year old. Bourbon and BJ took reserve! I screamed and jumped up and down. And ran out to greet B and BJ as the exited the ring. We took pictures together. And celebrated the ride. (I'll post pics later.) It felt good! What a huge win for Bourbon. And a little kitty too!!! Bourbon's earning some Ching to pay his own show bills. LOL. (okay not quit, but it helps) I was on cloud nine the rest of the night. I watched more classes....including a blue ribbon win by Bobby in a yearling class...Dr John Gladney taking a fourth in his Futurity class...and others by our barn's group under Bobby's training and exhibiting good hand. Connie you are right. I would have been very upset with myself if I had chickened out. Instead I can say I did it. The judges noticed me...at least three of them! And bourbon earned a reserve (2nd place) ribbon too! Wow! I'll stick around to cheer on a few friends the next few days. Do some tack shopping (always fun and expensive....) and will take a few rides on bourbon at the barn. It's now after midnight. So once again I'll hang it up....and get some rest. With very sweet dreams tonight, I'm sure.